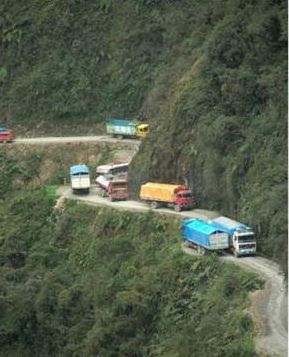 According to the Association for Safe International Road Travel, the title for World’s Most Dangerous Road goes to Bolivia’s old Yungas Road, which twists and turns for about 40 miles between the capital city of La Paz and the town of Coroico in the Yungas jungle region. If other roads seem risky, the old Yungas Road is nothing less than a suicide mission. Built in the 1930s by Paraguayan prisoners of war, the Yungas Road was until recently the main route from La Paz to Bolivia’s northern Amazon rainforest region. Dropping nearly 12,000 feet in overall elevation, the road is extremely narrow, subject to frequent landslides and fog, and offers no protection from the sheer cliffs that drop straight down for a couple thousand feet. Before a modernized and safer route was completed in 2006, somewhere between 100-200 fatalities occurred every year, and the roadside is presently littered with crosses and memorials. For obvious reasons, locals have given it a simple yet somber nickname – Death Road. By the way, there are quite a few companies in La Paz that offer extreme bike tours of the Yungas Road for adventure seekers. If you like teasing death, then this is the road for you.